I don't usually write about my son in terms of his learning disabilities, or list out what they are, since in part I don't have all the technical terminology. I know he has ADHD, dyslexia, auditory and visual processing issues, and sensory integration disorder. But I often see people spell out their child's learning disabilities more technically than that. I also don't write about it a lot, say, on my blog, because it bothers my son greatly when I refer to it, that 'people will know.' (I don't know where he gets this concern, as we have referred to it at home simply as 'learning differently' and with other positive terms, but he knows how he feels, and long ago realized that other kids he knows are ahead of him.) And a list of terms doesn't really describe how I feel when he misses a word he's known and now it's gone, when letters switch direction for him when he reads or writes, when he can't understand a new math concept (that he's heard over and over, so it's not really 'new'), when his frustration levels get him very upset and create home tension, or when he has an overload and I feel like I'm the one with overload. My son is 14 - he'll be 15 in December (good grief, I can't believe it). He's taller than I am, and shows no signs of stopping, I'm sure he's close to six feet tall or will be shortly. If my son learned only the things he could do on grade level, we'd exhaust the books for that level, and be stuck there for years. But AmblesideOnline changes all of that. Over his growing up in homeschool we have read the great books together - and his knowledge of the world has increased exponentially. While his math book is a second grade one from Math-U-See, and his handwriting is that of a child barely learning cursive in Handwriting Without Tears, and his reading skills are about third or fourth grade (but he 'runs out of gas' after a page, so that I couldn't require him to read on his own even those books), his 'listening skills' allow him to hear, for instance, all the Year 5 AmblesideOnline books (the year we've landed on, that we do together with his sister, our 11 yod. We aren't on Year 6, as they aren't grade-oriented as much, and because we made our own transitions in Year 4 and lingered there longer). He can listen to King Arthur with that rich language, This Country of Ours with its full history, Abraham Lincoln's World with its varied information, Age of Fable with its complicated stories, and yes, even Twelfth Night from Shakespeare in the bard's own language (with me at the laptop open to No Fear Shakespeare, to explain when we get lost :-). It's not easy reading everything aloud. I know about librivox, but for this year, I'm still doing the read alouds, and we're still doing it all with my daughter, too. I know we'll need some changes, as she needs to do more of the reading on her own (she just reads Anne of Green Gables on her own this year, and does a written narration of it). I wasn't ready to have my daughter read on her own while I read to her brother - it felt too much like she was banished while we got to be together. We do have separate times when he listens to extra books on CD (like Narnia) and she has time with me or her own reading, and those will expand next year, Lord willing. Children with LD's need to be taken to this smorgasbord of learning, too. They should not miss out on the grizzly bear that met up with Lewis and Clark, or on the acquisition of Excalibur, or the comedy of mistaken identities in Shakespeare, or on the mind-enlarging concept of all that was going on in the world when Abe Lincoln was a little boy. Rudyard Kipling, Leonardo DaVinci, and Rimsky-Korsakov should be familiar guests at the table, hymns of the faith should be anchors of their childhood, and God's Word - above and beyond all - should be the word they know and see and hear and read every day. And despite all the difficulty and personal investment in homeschooling my son, I cannot imagine that even the finest public school special education class would ever be able to match this. 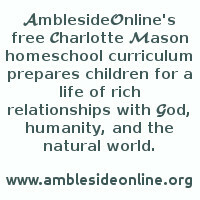 So - whatever it takes, I am committed to giving my son an AmblesideOnline education. The child's mind feeds on ideas, and I intend to be sure my son gets this rich curriculum. It's not easy, and every year I 're-invent' how we'll do it, what's working, how I can keep his sister's education paramount as well (and in the years before this, it was his two sisters, before our oldest graduated). And most nights, I feel pretty weary, as I try and balance all this with running a home and with my position in a ministry at our church. But - it's worth it. Be encouraged. You are giving your child - all your children, but especially children with 'learning differences' - not just a good education, or a better education, but the best education. That is my motivation.